Prattville is a city in Autauga and Elmore counties in the U.S. state of Alabama. It is the county seat of Autauga County. As of the 2010 Census, the population of the city is 33,960. The city is northwest of Montgomery. On February 17, 2008, Prattville was hit by an estimated EF3 tornado which destroyed more than 45 homes and businesses and damaged over 800. 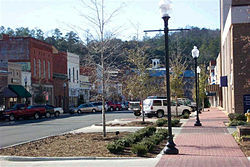 Wikimedia Commons has media related to Prattville, Alabama.